He who controls the past...: Secrets and Mysteries: Where's the Difference? Debunking Wedge of Aiud and other random aluminum from the past. Secrets and Mysteries: Where's the Difference? 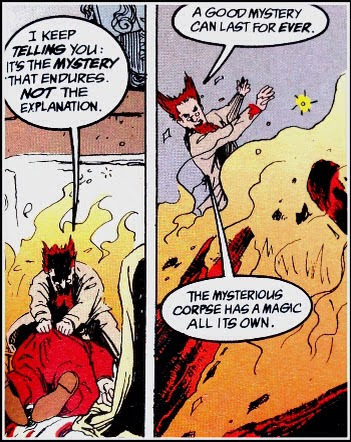 Cain and Abel, from Neil Gaiman's Sandman #40. "A Parliament of Rooks". What the Difference between a Mystery and a Secret? One is a question, and the other is an answer. Mysteries are widely known and shared. Secrets are carefully savoured and kept. Mysteries are perpetuated by their retelling, while Secrets - once shared - cease to be, become trivia, and are ultimately forgotten. Is it logically possible for a secret to be known by everyone? Mysteries don't care who knows them or what is said about them. Sometimes Mysteries are just answers that have been lost - for example: how were the pyramids built? In our modern high-tech world we can only guess, but I guarantee that in 2,600 BCE, in Egypt, someone knew and it wasn't Yoda or any other little green dude. And the methods they used would have been more efficient and resourceful than we could begin to imagine. A moment with Ogami Itto, from Lone Wolf and Cub # 12. Kazuo Koike and Gozeki Kojima. Another edition translates Itto's pronouncement as "The snow doesn't care that it chills the hearts of men." 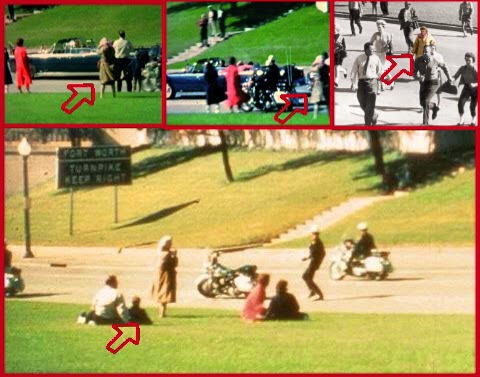 Who is the "Babushka woman" in Dallas 1963? She appears in many photos of the scene and seems to be photographing the entire assassination from the best vantage point. Despite police investigation, she was never identified*. The "Babushka Woman" never came forward to the Warren commission. Stranger still seems to be her lack of surprise in the pictures. She remains fixed while the three shots ring out and Kennedy explodes in front of her. Everyone else is on the ground or running. The truth - the Secret - is most likely mundane. Maybe she didn't have status in the U.S., so didn't come forward. Maybe she was traumatized. Maybe, for some unfathomable reason, she was a mannequin. Maybe she was a time-travelling Jackie Kennedy looking for the missing piece of Kennedy's brain. But I really doubt that, after the shooting, she travelled back to the future - at least not at any faster speed than the rest of us. One second per second. Just because it's a Mystery, doesn't mean there's a conspiracy. *. Years later a woman came forward claiming to be the Babushka woman. Her story defied belief, but you can still buy her autograph or her book online. A Conspiracy Theory is a Mystery Wrapped in a Secret. Even when a Secret is told, sometimes it creates a larger Mystery - when that Secret cannot be proven. The "proof" is its unprovability. 9/11. Sandy Hook. Malaysian flight MH370. False flags? Staged events? Conspiracies that continue to grow like weeds in an unkempt garden, perpetuated by their lack of substance. Little needs to be said about the rediculousness of personal attacks that have been made on the families of the deceased. Sometimes there are unexplained accidents. Sometimes there are lone gunmen. The core theories of most conspiracies simply fall apart in the face of the shear incompetence inherent in human beings. A super-powerful cabal of diabolical geniuses? We can hardly keep a baggage handling system running at an airport - never mind fake a moon landing or hijack a whole plane in Indonesia and crash it months later in the Ukraine; as my favorite conspiracy theory states. Secrets can be banal, or Secrets can be brutal. Jack the Ripper was Nobody Special. Muddying the waters were artists painting portraits based on photos of the murders; copy-cats continuing to write JTR letters "From Hell"; phony diaries were created. (Both for JTR and Hitler.). Later lust-murders that copy the M.O. 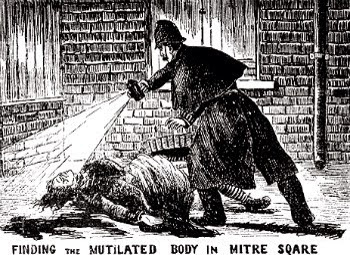 of Jack the Ripper are both shocking and tempting to tie to his knife - but the lust-murder has been some kind of rare male-brain mis-wire for millennia and continues to be repeated in some kind of perverse cycle. Modern FBI profiling* portrays Jack the Ripper as ordinary in appearance, wearing respectable clothes and working in a job related to his paraphilia - in a butcher shop, mortuary or hospital, possibly. (The profile notes that London Hospital was only one block away from the first JTR murder.) Ordinary. Most likely interviewed by the police and overlooked. Who wants to think of this street butcher as ordinary - better to think he was Royalty, an Impressionist, a wide-eyed lunatic, a Freemason or some modern Dr Frankenstein? So authors who more recently identify JTR wrap their secret in a mystery to perpetuate it. But the truth is this: he was a classic disorganized lust-murderer and no-one will ever know his name. People that drank with him in the Whitechapel pubs would have had no idea who was sitting across from them. And as proud as he would have been of his "work", his passing left the world no poorer. If humankind has a collective trait, it is horror vacui - the fear of empty space. Present us with a Mystery and the mind staggers about in the darkened room, searching for the switch that will illuminate the Answer. But the Answers that are found in the dark are the result of blind groping and often bare little resemblance to an Answer. What do we find in the dark? Ghosts, goblins, witches, aliens. In real life, Secrets are often mundane, ordinary, banal. And no fun. The earth and its environs has been explained to us ad nauseum - from the smallest sub-atomic particle to the unseen dwarf planets of the Oort Cloud. If we don't know, it must be alien. What else can it be? The mystery of the Wedge/ Object of Aiud is no exception. For so many years, the vast majority of print expended on the object only furthered the mystery of what it is. Aluminum-Copper-Silicon. Clearly cast and machined. Found in soil 25,000 years old with Mastodon bones. A few lone voices called it an Excavator Bucket Tooth - most likely falling off of the machine that had been doing the digging. Booooooooring. 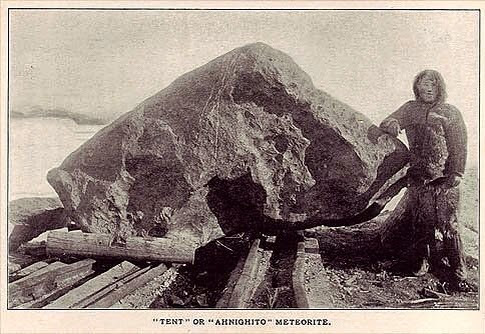 Much more exciting to think that it had fallen off a space-ship or time-machine that had collided with a "hairy rhinoceros". And in classic X-files fashion, Okham's razor is denigrated and insulted. Just because it looks just like a Clamshell Excavator Bucket Tooth; is made out of similar materials; and was found at the bottom of an excavation, wrapped in material that was being dug - that's no reason to believe that it's a part of the excavator. That's not a mystery. That's an OOPART. Something that always catches my attention are claims of OOPARTs. There are few Mysteries that challenge so many tenants of accepted Dogma. Aluminum is a particularly interesting one because there are no demonstrable native* sources of ancient aluminum found in the archeological record - meaning that, taken at face value, any finds of aluminum should not predate its human discovery and refining in the early-to-mid 19th century. So the Wedge of Aiud or the Belt Buckle of Chou Chou (as described by their proponents) are impossible without recourse to some kind of extraterrestrial or out-of-time intervention. Alien Time-Travellers! 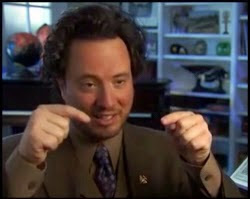 And the fact that educated people that have studied archaeology and material sciences say "it can't be so", is used to self-servingly demonstrate the avant-garde nature of the conspiracy writers insights. But then, for every proponent of "prion disease" (such as BSE or Kuru) that is eventually proved right, there are 999 flat earthing free energy gurus without a clue. What I'm trying to get across is this: just because "we" don't know or understand something (or don't like the Secret), it doesn't require us to automatically jump to the alien conclusion. 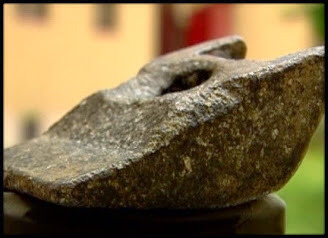 The Wedge of Aiud is Mysterious. The Babushka Woman and Jack the Ripper's identities are a Secret. But the truth is most likely ordinary. And we must always be prepared to not know an answer. People from Cuban get into our country and they are separated by a huge body of water. Mexican aliens have been known to dig tunnels. It is made up of aluminum wire and it can be easily screwed.While comparing with other fences chain link fence is the cheaper one!!!! !